An oral history interview of Warren McFarland, a telegrapher, train dispatcher, railroad station agent, grocery clerk, Railroad Safety and Service Agent, Assistant Regional Director and Regional Manager for the Interstate Commerce Commission, and Director of the Office of Compliance and Consumer Assistance. The interview was conducted by Geoffrey Cravero at the University of Central Florida in Orlando, Florida, on January 28, 2016. Some of the interview topics covered include McFarland’s early years and formative experiences, his family life, growing up as the son of a railroad station agent and telegrapher in a railroad depot, World War II, railroad work and telegraphy in his time versus his father’s time, his first job as a grocery clerk, the “extra board” and railroad seniority, working for the Interstate Commerce Commission (ICC), the Trans-Alaska Pipeline System, the Morse Telegraph Club, female telegraphers, American Morse Code versus International Morse Code, acquiring a piece of the first transcontinental telegraph line, train dispatching, overcoming communication limits, an explanation of telegrapher’s paralysis, and Guglielmo Marconi’s contributions to wireless telegraphy. Oral history interview of Warren McFarland Interview conducted by Geoffrey Cravero at the University of Central Florida in Orlando, Florida. McFarland, Warren. Interviewed by Geoffrey Cravero. Audio/video record available. RICHES of Central Florida, Orlando, Florida. Digital transcript of original 35-minute and 41-second oral history: McFarland, Warren. Interviewed by Geoffrey Cravero. Audio/video record available. RICHES of Central Florida, Orlando, Florida. Originally created by Warren McFarland and Geoffrey Cravero and published by RICHES of Central Florida. Coe, Lewis. The Telegraph: A History of Morse's Invention and Its Predecessors in the United States. Jefferson, N.C.: McFarland, 1993. Stone, Richard D. The Interstate Commerce Commission and the Railroad Industry: A History of Regulatory Policy. New York: Praeger, 1991. Today is Thursday, January 28th, 2016. My name’s Geoffrey Cravero and I’m speaking with Warren McFarland at the University of Central Florida in Orlando. Thanks for speaking with us today, Mr. McFarland. Let’s, uh, begin with some of your biography. Could you, uh, tell us a little bit about where you’re originally from and your upbringing? Well, I was—I was born in Ohio, but we moved to Orlando when I was a year and a half old, so I count myself as a Floridian, and my father worked for the railroad here in Or—Orlando, and eventually went to Avon Park and was Railroad Agent there for many years, and that’s where I grew up, went to high school and—and, uh, where I went—learned from him—I learned the telegraph, I learned railroad work, and eventually went to work for the railroad after I graduated from high school in 1941. Um, had—had planned to go to college, but 1941 was not a good year to college, uh [coughs] and, uh, I wound up working on another railroad division, rather than the one that went through Avon Park, w—working out of Ocala, and I worked there, uh, for like 25 years, and then I was offered a position with the Interstate Commerce Commission, and I went, um—went with them, and uh, we—we lived in different places: uh, Chicago, Atlanta, San Francisco, and Washington, D.C, and I eventually retired as Director of the Office of Compliance for the Interstate Commerce Commission out of Washington, and I moved—we moved back to Florida after I retired, and been living here ever since. [laughs] So that’s where he stayed. Were any of them, uh—did they follow in the family business of the railroad? No, none of them. I’m the only one out of—out of, uh—out of six, I’m the only one that went into the railroad business, um, and my—my youngest sister’s husband did go into the railroad business, and his son also went into the railroad business, and I had an uncle that was a railroad man. So it—railroading has—has always been pretty much a—a family, uh, affair in many—in many families. You know, one—one person gets started and then—then others go in, but—but none of my brothers and sisters, uh, were interested. Well, you mentioned, uh—that you—your father, uh, was a station agent and telegrapher in Avon Park. Um, could you tell us a little bit about growing up in the depot? What sort of, uh—what sort of skills and knowledge did you kind of acquire as a young man? Well, [clears throat] uh, I—I was always—I was not a, uh— crazy about trains, but I was interested in trains and—and—and the railroading, and I can remember when I could barely, uh, reach—stand up and—and reach the tabletop like this, and my dad had me doing things that I could do in the—like stamping—taking the rubber stamp and stamping it on a piece of paper on—on what’s called a waybill, which is a—a ship—a shipment, uh, document that you fill out when you have a shipment to make, and, uh, I would st—stamp the—the Avon Park’s stamp on there that showed this, that, where it started from, but, that had to have been about about—5-6 years old when I did that, and I—off and on, all—all during my school years, I just hung around there, and I—I didn’t—I wasn’t consciously preparing for a career in railroading. A matter of fact: my older brothers and sisters all went to college and—and—and it was planned for me to go also, but, as I said earlier, I graduated in 1941, and—and they were already drafting people out of—out of my class, and, um, so I—I knew it was a matter of time. So I didn’t think there was much point in going to college at that time. So I didn’t go until much later, but, uh, it—it—when—when I was in my senior year in high school, uh, that’s when you could see what was happening: the world was in turmoil, and, um—and, as I said, members of my class had—had been called up, and—so I began to learn telegraphy, and my father taught me and I practiced, and then after I graduated from—from, uh, school, he, um, told the—the railroad that I was, uh, sufficiently knowledgeable to go to work, and, uh—I—I didn’t—As I said, I didn’t—wasn’t consciously, um, aware that I was absorbing everything that I did absorb during those years, uh, hanging around the depot, but I learned an awful lot that I didn’t know I’d learned, until I went out on my own and was working. What, uh—did you notice, uh, any, uh, major differences between the—the time of your father and yours when it c—comes to the, you know—the telegraphing and the—the depots? Well, actually, no [laughs]. The very first paying job I—I worked as a clerk in the A&P grocery store on Saturdays, uh, which—that—in—in a small town like Avon Park, that was about the only job that—kind of job that was available to a—to a high school kid, and there were three of four, uh, grocery stores in town, and the A&P, which was a chain, the re—others were all independent, but everybody—all the kids that I knew worked at one—one of the grocery stores. That’s where you got your first job. Yes, you—when—when you begin railroading as—as a telegraph operator, you—you are put on what they call “the extra board.” Uh, um, you—you—your first day, you establish the date of your seniority, and that means that anybody that’s hired after you—you—you have rights over them on—on—if you want to claim a job or something like that, and—and the same thing hold—anybody that[sic] hired ahead of you can claim a job that’s—whether you want—whether you want it or not, and so, you—as—on the extra board, you just went where you were needed. Uh, somebody needed to be off sick, uh—there were no vacation—no paid vacation at the time, so that—uh, there was not much of that. Although some—some people did take vacations, and you went and worked for them, or they put on extra jobs because of seasonal problems—uh, season—seasonable increases in—in business, they’d put on an extra job somewhere to help the dispatchers handle trains, and so, you worked all over. I worked, uh, I don’t know how many different places. I could probably count it up. Not worth it. [laughs] Um, let’s see. Before the, uh, Atlantic Coast Line Railroad merged with the Seaboard Air Line [Railroad], um, and absorbed the Tavares & Gulf Railroad in 1969, you’d already moved to California at that point. Could you tell us a little bit about what you did out there with the Interstate Commerce Commission? Well, I—I—I—my first job with the ICC was in Chicago as—as a Railroad Safety and Service Agent, and, uh, in—in that capacity, I—I made what we call “agency checks” and “yard checks,” and we—we had two things: we were looking for compliance with the—with the tariffs, which had the force of law, and we were looking for, um, equipment that was not being used efficiently, and so, the—as the—and—and the other thing that—that in—in ’65, we also were charged with safety, uh, inspections of equipment and things of that nature. However, in—in ’67 —1967, all of that was transferred into the newly-formed [U.S.] Department of Transportation, and so we no longer had any kind of safety obligation, but we still retained the car service, which was car—car efficiency, and—and the tariff and—and regulation, and so, I would go from—to various agencies along, um—in my territory. I had an—had an assigned territory, and I was supposed to visit these agencies on a periodic basis and ver—verify that they were complying with all of the rules and regulations, and that they were not delaying any equipment—and that was being used, and from there I—I was transferred to Atlanta doing the same thing, but, uh—and I stayed there for, uh, about five years, and then I was, uh, promoted and went back to Chicago as Assistant Regional Director there, and in—in that capacity, I was assisting the Re—Regional Director and overseeing all of the people that were doing the kind of work I was just desc—describing, and then, um, in ’73, I was, uh, promoted again and went to, um, San Francisco as, um, Regional Manager, and I had the, uh, responsibility for the 13 western states, plus Alaska and Hawaii. Uh, now, railroads and—and buses and trucks don’t run to Hawaii from the mainland, but—but—so we didn’t do much there, but what—I still had the responsibility for Hawaii and Alaska, and I was overseeing not only the—the people who were doing the work that I was talking about earlier, but I was also overseeing the—the lawyers, who—who, uh, handled the cases that were made and the—and the accountants that were—were auditing the—the books of the various, uh, carriers—motor and rail and barge lines and pipelines, and part of the—part of—and—and when I was in, um, San Francisco, the, um, uh, [Trans-]Alaska Pipeline [System] was being built and we had to oversee that, and the law required, at that time, that—and people usually don’t know this because a pipeline is a common carrier, and so, in order to know what they could charge, you had to know what their costs were to build and maintain the—the pipeline, and to do that, we had to have auditors go in and verify, and about ha—halfway through construction, everybody woke up that this was a nine billion dollar, uh, enterprise, and if we waited ‘til after the fact to—to, uh, audit it, we’d nev—they’d never know what they—what they could po—possibly charge. So we sent a team of auditors up there, and they stayed there for about three years determining the actual cost so that the pipeline could go into—into operation when it was finished, but then, after—I was—I was in San Francisco until 1981, and, um, the—the new chairman that had been appointed by President [Ronald] Reagan, uh, was—knew me, and he brought me into Washington[, D.C.] as Director of the Office of Compliance and Consumer Assistance, and I stayed there until I retired in ’85, but in—in Washington, I had oversight over the—the entire country for all of the things that I’ve been talking about that we did. Plus, uh, a lot of local stuff and—going up to Congress and taking care of that sort of thing. I read, uh, [clears throat] that the Morse Telegraph Club[, Inc.] used to meet at the [Central Florida] Railroad Museum on [Samuel] Morse’s birthday. Could you tell me a little about, uh, the club and how that all came about? Well, it’s—it—it started, actually, back in the 1930s. Uh, some people that were telegraphers decided that they—that it would be a good idea to make—to have a club, and it was more or less a fraternal organization, at the time. I say “fraternal,” although there are a lot of women telegraphers. Uh, throughout the—the whole history of telegraphy, there—there have been a lot of women telegraphers, and probably, on the railroad, was—may have well have been the first industry that paid women the same wage as men for doing the same job, which was not true in—in—not true even today in many—many cases, but, uh, anyhow, these people got together and—and, as I said, it was just sort of a—I won’t say a drinking club, because it wasn’t that, but it was—it was a social club more than anything else, and then it—it sort of faded away a little bit, uh, and just hanging on by its teeth, you might say, and—and then, um, uh—I’m not sure of the exact dates, but sometime after World War II, when—when telegraphy began to fade away, as I had mentioned earlier on [inaudible] on the railroad, Western Union [Company] had al—already almost gone completely to—to teletype, uh, by that time, and, um, so the—the organization transformed itself into, uh, an historical preservation organization, and the goal of—of the, um—of the organization today is to preserve the knowledge and history and the technology that existed, uh, when the telegraph was in use, and, um, we organize in chapters. Uh, we used to have a chapter in every state and some states had—had, uh, two chapters, but, uh, time has taken its toll and—and, um, now we’re down, uh—for example, the Florida chapter, of which I’m a member, um, encompasses Georgia and—and South Carolina and Tennessee, and—and Alabama. Uh, and so, the membership—the membership hasn’t really declined that much, but the membership of people who actually worked as telegraphers has obviously gone down—way down. Somebody made an estimate, and I don’t know the truth of it or not, but said there were only about 150 of us left in the organization that actually earned a living as—as telegraphers. Um, that may be true, it may not be true. I don’t know, but at the present time, we have probably around 3,000 members and we have around 30 chapters in the United States and Canada, and we—we do demonstrations at—at just about any place that will invite us to do a demonstration, but mostly to local historical societies that have an annual affair and they want something, uh, of, um—that—that has some historical significance, and so they’ll ask us to come and do—do a demonstration [clears throat], and many of these members that we have now have taught themselves to telegraph. They’ve never worked as telegraphers, but they’ve taught themselves to telegraph, and some of the—some of the members are ham radio operators, which uses a—a different code, but it’s still Morse Code. It’s an international code, known as International [Morse] Code, as opposed to American Morse [Code], which was the kind that was used on railroads and Western Union and stock markets and, uh, all of that sort of thing. [clears throat] I understand that it— somehow you, uh—you acquired a piece of the very first telegraph line that stretched all the way out to California. And how’d that—how’d that—how’d you end up acquiring that? To bring that today, uh, but we—we have a website that’s—the Florida chapter has a website, and, uh, an outfit in Utah was setting up, um, an exhibit in a museum, uh, where at a—at a—at a former Army camp. Uh, when I say former, I’m talking about [American] Civil War-era Army camp [laughs] that was one of the first stations on the Transcontinental Tre—Telegraph Line, and so they wanted some historical reference to the telegraph in their museum there, and, uh, they found our website on the internet and contacted us, and we were able to get them some telegraph instruments and assist them, and some months later, they, uh, contacted us again and said they had come into possession of a link of the original Transcontinental Telegraph Wire—came from Northeastern, uh, Nevada—just across the Utah line in Northeastern Nevada, and a man had found it and had donated, uh, a length of it—I don’t know how much—but had donated a length of it to this museum, and they wanted to know if we would like to have a piece of it, and so they sent us about two and a half feet: about 30 inches of it—a piece about that long, and it’s—it’s—it was a nine gauge, which is heavy, heavy wire. I mean, it’s—it’s almost a quarter, uh—not—not a quarter. Maybe, uh—it’s over an eighth of an inch thick—uh, the—the wire is, and it’s almost impossible to bend it with your bare hands. It’s—it’s that thick, and it’d been laying out in the, uh—in the open in the desert out there near—near the old, uh, Pony Express route and the, um, stagecoach route that went west through there [coughs], and, um, they, uh—they kept, um—they kept it there, um, um—it—laid out there in the desert, and—and doesn’t rust like it would in—here in Florida, you know? It would all be rusted away [laughs] if that had happened here, and so we had that piece of—of the wire, and we—we debated as a—as an organization what to do with it. It wasn’t big enough to use anywhere really. So we wound up—and we cut it into pieces about, um, six inches long and mounted it on plaques, uh, and with a little bit of a history of it on the back of the plaque, and we use that in our demonstrations. Uh, we take it—take it around where—and we—we have these plaques distributed among the membership, so that there’s al—[always] one available somewhere, but it’s very interesting and—and—the interesting—one of the things about it, that the—it was shipped to me—mailed to me in a padded envelope and it was rolled—folded up, and I tried to straighten it out with my hands when I took it out of the envelope. I could not do it. We had to finally put it in a vice and—and hold down one end of it, and finally got it straightened out, and it was so hard that you couldn’t cut it with wire cutters or anything like that. You had to use a saw to cut it, uh [clears throat] but that was what—the wire that was used in the, uh, original Transcontinental Telegraph Line in 8—finished in 1861 [coughs]. Well, I—I don’t know anything off the top of my head. Uh, uh, railroading was an interesting occupation, and I’m sure it’s still is, although I’ve been away from it now for many years. I’ve been retired for 30 years now, so, uh—and I—I’d left the railroad for 20 years before that, so [laughs] it’s been awhile since I’ve been railroading, but, I—I enjoyed the—the—working there, and as I said, I worked as a train dispatcher, which was, um, very complex and complicated job to keep the trains moving. Uh, when I started, an old time dispatcher said, “Oh, there’s nothing to it.” Said, “You just—you just meet ‘em—don’t meet ‘em too close together or too far apart.” [laughs] Well, its’—that’s an oversimplification, but it—it’s what you—that’s exactly what you were trying to do was—is to move the trains over the—over the, uh, territory wi—in—in the most efficient manner possible, and that, you know—and single track and—and—and, uh, with limited, uh, communication. You had no communication—when I started, you had no communication with—with the people on the train other than handing them up, uh—as they pass an open telegraph office you—you could hand them up orders or, uh, messages of what you want to do, or they could throw off something as they went by, but, um, that was an interesting, uh, occupation and—and very demanding, very challenging. Um, somewhat comparable to an aircraft, uh, uh, air—air controller, except that we couldn’t tell the tr—trains to pull up and go around or—or, uh, fly higher and—and not hit—hit the train ahead of them. They were—they were, uh, consigned to the track. They had to stay on the track, so made—made it a little bit more complicated. That this is not working. I don’t know what it is, but, this—this is the sound [tapping]—this is the sound of—this instrument in—in this is called a sounder, [tapping] and this, uh, box-like object is called a resonator, and the purpose of it is to focus the sound so it can be, uh, heard more clearly, and the can—the Prince Albert tobacco can, we—we now—we call it the “first solid-state amplifier,” because it makes a difference [tapping]. If you can hear the different—[tapping] with and without the can [tapping], and somebody back in the—in the early days of this discovered that you could do that—that, because a railroad agent had more to do than just sit at a desk and listen—listen for this. Uh, he had to be out in the freight warehouse or [inaudible] out—outside with the train going by or something like that, and he needed to be able to hear the dispatcher’s wire when that was happening. So that, um, uh—that really changed the way that you could do that, and—and [inaudible] I never worked a job that didn’t have a can stuck in the resonator like that, and this—this, uh, is just the same thing and—and—[tapping] with a key here. I’ll move this out of the way. This—this has a key [tapping] and that’s the way you sound it, and you make a dot [tap] by closing the key [tap] real quickly and a dash [tap] by holding it down three times as long as you do for the dot, and you [tapping] do that to spell out, uh, everything that you want to say, and, like texters today, we use a lot of abbreviations. As a matter of fact, many of the abbreviations that texters are using were being used by telegraphers a hundred years ago, but, this is the key [tap] and this is the sounder, and then this called a bug, and it’s called a bug because the logo is a beetle, and nobody knows why they chose that as their logo, but they did. It started out—if you—if you worked 8 hours or 12 hours a day, which, uh, up until the Hours of Service [HOS] law went into effect in 1908, that’s, uh—you worked 12 hours a day, [tapping] and you worked 12 hours a day with this up and down motion you—you developed telegrapher’s paralysis. We call it carpel tunnel syndrome now, but it was telegrapher’s paralysis then [tapping], and so they began experimenting what you could do to—to alleviate it, and the first thing they did was turn the key on its side and work it back and forth, and they kept working with it and eventually came into this form, and this is now called a vi—a—a speed key, and I can’t demonstrate because my power somehow or another is not working here today [tapping], but, um, you—the speed key—if—if I want to make a—a series of dots with—with this straight key [tapping], it goes like that, but, with the speed key, I can do it just [tap] with—with one movement of my thumb, and so, that relieved the carpel tunnel, but it also speeded everything up. And so, those are the—those are the—the principal instruments that—that were used by landline telegraphers, and that—the—this is called American Morse, and it was used, uh, all over—all over the world, really. It—it just changed the whole world, and then, uh, in the late 8—1800s, [Guglielmo] Marconi discovered that you could send, uh, power through the, uh—through the air and—and modulate it and—and make a—a code—send code through the air, and they did—they did that and—using a—a slightly different code. Uh, the—this code—the American Morse Code has a lot of spaces in it, which makes it, uh, uh, a lot quicker, but, with the—when it went to radio, they couldn’t tell whether the spaces were accidental or intentional, and so they eliminated the space letters and everything became, um, uh, the—the tone then—the length of the tone was—determined whether it was a dot or a dash, and that sounded like this [beeping], but, uh—and that’s still used by ham radio operators and all base radio stations, like your local police station and your fire stations and things of that nature, are required by the Federal Communications Commission to identify themselves every hour, and now they use a computer, but every hour on the hour, uh, these—these stations will identify themselves using International Morse Code, sending their call letters—whatever they might be, and that—your television stations, your—your commercial radio stations, they all have to do this—do that, and they do it. So that, uh, America—I mean, the International Morse Code is still in use, uh, quite a bit with ham radio operators and that. American Morse—the last known use in the United States was in 1983, but th—that was just really an anomaly, because it had—by the mid-70s it had pretty much disappeared, but there’s just this one place out in Montana that still was using it until 1983. That’s fantastic [clears throat]. Mr. McFarland, we really appreciate you sharing your story with us and demonstrating the tools of your trade. Well, I’m happy to do it. Happy to do it. Alright. Well, thank you so much. That will conclude our interview and, uh, we really appreciate you being here with us. Great Atlantic & Pacific Tea Company. Golden Spike National Historic Site. McFarland, Warren and Cravero, Geoffrey. 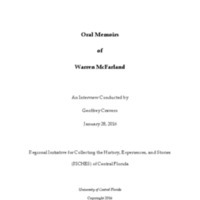 “Oral History of Warren McFarland.” RICHES of Central Florida accessed April 20, 2019, https://richesmi.cah.ucf.edu/omeka/items/show/7816.